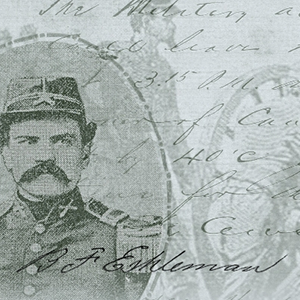 This collection contains the mementos Lieutenant Colonel Benjamin Franklin Eshleman, a former commander of the Washington Artillery battalion, saved in his scrapbook. It portrays a civil war colonel’s dedication to preserving the memory of his unit along with a larger more important purpose of memorializing the era of the confederate soldier. The scrapbook and papers were handed down the familial line from Eshleman to his daughter and eventually given to the University of South Carolina Beaufort (USCB) by the generous donation of Jack and Mindy Castles.